​The Commercial Scallop (Pecten fumatus) is targeted across two Victorian scallop fisheries, the Scallop (Dive) Port Phillip Bay and the Scallop (Ocean) Fishery. Scallops are bivalve molluscs meaning they have two shells joined together. Scallops can be found in or on soft sediments ranging from mud to course sand. They usually lie buried with only the flat valve visible. Scallops may be found in discrete beds from 1 to 120m. Scallops feed by filtering the water to obtain plankton and other minute foods. They move by jetting water in a series of spurts from its shell. Scallops are hermaphrodites, being both male and female at the same time. Individuals mature sexually between 12 and 18 months. Spawning occurs during spring (August to November). Larval scallops drift as plankton for up to six weeks before first settlement. They attach to a hard surface such as seaweed or mussel and oyster shells and remain attached until reaching around 6mm in length. The small scallops then detach themselves and settle into sediments and bury in so that only the top flat shell is visible. Scallops can live to be ten years old and grow to a maximum size of 140mm. Commonly they live for only three years reaching about 80mm in length. Commercially caught scallops are typically two years of age after reproducing at least once. Where is the Scallop fishery? 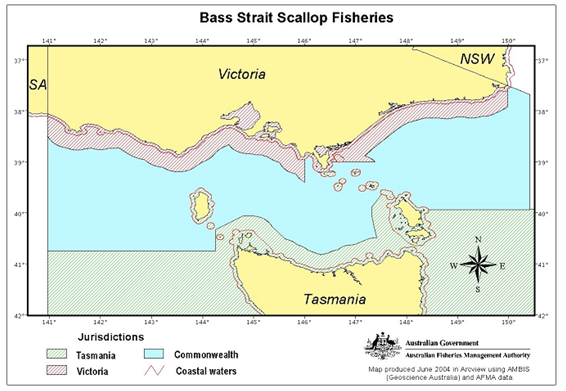 The Victorian fishery occurs 20 nautical miles out from the Victorian coast line (current boundaries settled in the OCS arrangement between Commonwealth and Victoria in June 1986). Commercial scallop fishing occurs offshore with dredges, and through hand collection in Victoria's Port Phillip Bay. Historically, the majority of the fishing activity in the Victorian zone has occurred in the eastern waters of the State, with most vessels launching from the ports of Lakes Entrance and Welshpool. Fishing for scallops is generally limited from July to December when the water temperatures are coolest. At this time of the year the scallop is in the best eating condition. Scallops are caught by dredging where a vessel tows a single dredge which is dragged along the seabed. Dredges are deployed from the rear of the boat and can be up to 4.5 m wide. The contents of the dredge basket (when retrieved) are sorted on board the vessel and undersized scallops are immediately returned to the water. The current Total Allowable Commercial Catch (TACC) for the Scallop (Ocean) Fishery is 135tonnes. The Port Phillip Bay Scallop Fishery has a single commercial access licence, which allows harvest by hand only across six harvest zones. There is a 90 millimetre legal minimum size and a prohibition on commercial fishing in certain areas of the bay. The current Total Allowable Commercial Catch (TACC) for the Scallop (Port Phillip Bay Dive) Fishery is 60tonnes. The Port Phillip Bay (Dive) Scallop Fishery is classified in the 2016 Australian Status of Fish Stocks as 'Sustainable'. The Scallop (Ocean) Fishery is classified as 'undefined', largely due to a lack of fishing operations occurring in these waters in recent years, therefore there is no stock abundance or catch data on which to make a reasonable assumption on sustainability.